Who will solve this mystery for me ....? CORLETT[E], Ethel aka ZELDA, Adelina (b Raglan, New Zealand c 1866; d unknown). ‘New Zealand’s first homegrown prima donna’. Well, yes, I suppose so. I don't know of an earlier one. At that stage in time, people were coming to New Zealand, not leaving it. But Signorina Zelda would have been a ten-line article, had I not fallen for her mother. The story of the Corlett family, or the part of its history I’ve managed to unfold, is colourful. It also has no beginning and no end. Yet. In 1859, the ship Mermaid from Liverpool to Auckland included among its 357 passengers a Mr and Mrs Corlett. Who they were, and from whence they came, I have simply not been able to discover. The ‘evidence’ is dramatically conflicting. In the one census in which I find her, Mrs T[h]eresa J[osephine] Corlett claimed to have been born in Portugal. Her children, in later censi, say their father was born in Spain and their mother in the Isle of Man. Another time they are both ‘English’. The most likely comes in 1900 when three of them (oh! I don’t think it’s they) give their parents’ birthplaces as Isle of Man (where Corletts flourish) and Ireland (where Theresas do likewise). Alas, daughter Nellie, in the same census, opts for France and Portugal. wWhat seems obvious, in sum, is that there was some sort of irregularity to hide. Mrs Corlett[e] became a notable from her arrival in Auckland. She was ‘a pupil of Garcia’, a ‘soprano of great compass and flexibility’ and a pianist, and on 22 February 1860, she gave a concert at Auckland’s Mechanics Hall. And then a second ‘As a vocalist Mrs Corlett is one of the most finished we have ever heard in Auckland ..’. The Auckland Choral Society snapped her up as star soprano (Israel in Egypt, ‘Softly Sighs’), she advertised for pupils from her Hobson Street home, and moved in no time into a premier position in Auckland’s musical world, promoting regular concerts (‘Miserere’, ‘The Convent Cell’, ‘Softly Sighs’, ‘Kathleen Mavourneen, Little Nell’, ‘Barney O’Hea etc). After having been queen of Auckland music for a year or so, however, Mrs C seems to have moved away. Husband’s job? I see her at Onehunga (‘I remember when I sat under the peach trees…’), Otahuhu, Thames, and then, more semi-permanently at Raglan, in the Waikato. And the history of Raglan tells us ‘The first Raglan school was a private one run by Mrs Corlett in a tent commencing in 1866.’ It was in Raglan that child number four, Ethel, was born. There was one more to come. Harry Moore Corlett. Seemingly in 1870. 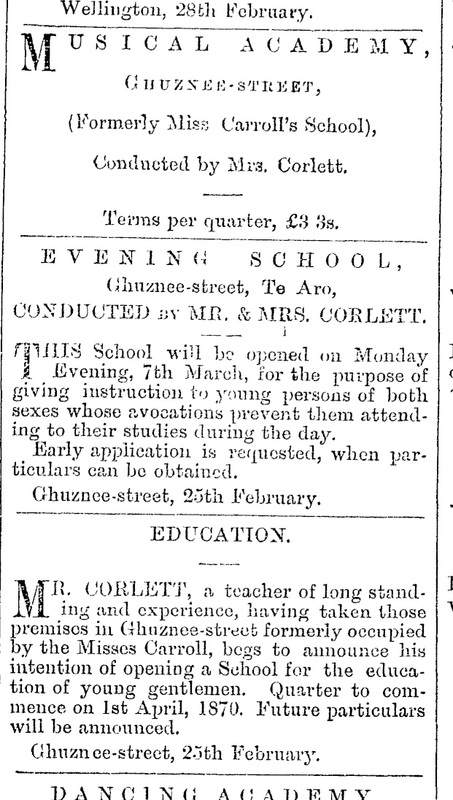 And then Mrs C moves to Wellington where she opens a Music Academy in Molesworth Street, not Ghuznee Street. In parallel, she opened another Academy teaching fancy work, wax flowers and ferns (she won many a prize for her wax flowers), leather work, Italian painting, ornamental needlework, gilding, promoted Mrs Corlett’s singing classes, taught at the Thorndon Private School, and under the thin pseudonym of ‘Silver Pen’ began writing sentimental verse and spiky political sketches in jolly doggerel for the Wellington Independent. She seems, in the process, to have made a few friends and the odd enemy in the corridors of petty pakeha power. In 1875, ‘She broke up her home in Wellington despite the remonstrances of [Hon Dr Grace], and with her 5 children started for New South Wales and from there to San Francisco determined to earn a living and a name by the exercise of her brains’. Grace smiled that she had ‘sixteen drops of the devil’s blood in her’, which sounds about right. On 17 May they left on the Edwin Fox, then the Ravenstonedale, destination America. In August, they stopped at Hawaii, which welcomed ‘a lady of culture and accomplishments .. with much skill as a vocalist’. On 21 August she and eldest daughter, Theresa jr (b Auckland 8 March 1863), ‘under the patronge of the King', gave a ‘Musical Concert and Recitation', at Honolulu Theatre. 21 January 1876 the two ladies gave ‘an evening of poetry and song’ at San Francisco’s Pacific Hall, in no time the two of them were manufacturing wax flowers, and … oh, no! At last! 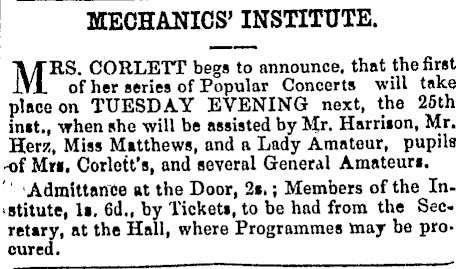 A series of concerts were announced to be directed by Mrs J S Corlett! Aha! are those initials for real? 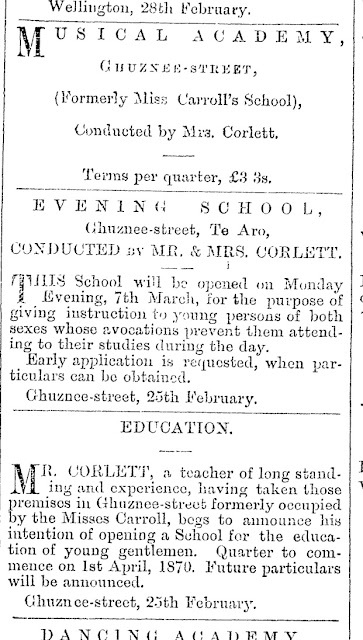 Mrs Corlett can be seen reading her poetry at the Temperance League, exhibiting her wax creations at the Mechanic Institute Fair, at the same time as writing newspaper copy for the local press and a column in the vein of Emily Soldene’s ‘London Week by Week’ for the New Zealand Herald. And, of course, preparing her three daughters for a career. In 1879, Theresa took the part of Hebe in a West Coast Pinafore and Nellie debuted as Desdemona at a local carnival. Neither Theresa nor Nellie had a prominent career in the theatre. Theresa married in 1885, Edward Batchelder Thompson, and died at the age of 38. 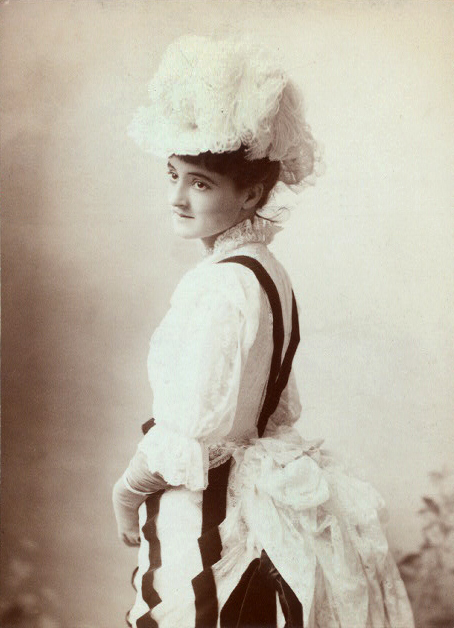 Nellie was still ‘Helen Corlette, actress’ in 1900. Herbert de Wilton (!) Corlette (‘dog handler’) and Harry Moore Corlette (‘manager of the Electric Light and Gas Co’) didn’t go into the theatre. Or even wax flowers. All mother’s hopes were on Ethel. And Ethel was promising. When W T Carleton paid one of his visits to San Francisco (Teresa had appeared locally with him before), Ethel sang for him and was cast in the chorus of his touring company, understudying Louise Paullin as Nanon and Yum-Yum. And in Boston, Miss Paullin was off. And Miss Corlette was on. And she did splendidly, so the press (ie mother) reported. 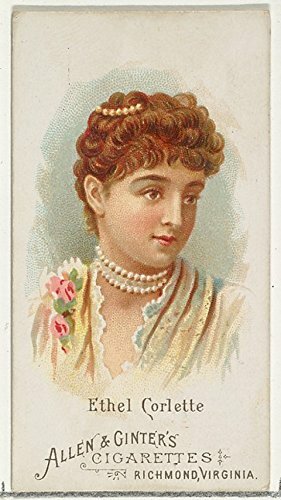 She appeared in several musical comedy companies (Donnelly and Girard’s Natural Gas, Harrigan’s Pete), and in December 1890 Theresa decided to take her to Europe. Apparently to study (although mama went into print to deny that her daughter had any other teacher but herself) and hopefully to work. The ship list registers Miss Ethel Corlett 21 single and Mrs Helen Corlett 51 married. So mama is Helen now? And … married? I see them (still ‘Helen’, or is this Nellie?) travelling back to America in 1891. Ethel, mama reports to the News Letter, has been taking lessons with Anna Lagrange in Paris. While she was at home, I see her singing Agathe in Der Freischütz at the San Francisco Grand. And then it was back to Italy. And a change of name. Her teacher (but surely that was mama?) christened her ‘Adelina Zelda’. Mlle Zelda started to appear on Italian stage, it seems, in 1894. There are undated reports of her at Bassano, in the Vicenza press, and making a debut at Malta as ‘the star of an Italian opera company’ in Lucia di Lammermoor and Faust. The press paras, which had nothing of the puff about them (mother knew better), were undoubtedly sent by Theresa. The Malta engagement, we are told by other sources, was for five nights. San Francisco said six months. Mother records that she had sung Filina, Dinorah, Amina and Rosina (somewhere) but oddly doesn’t mention Lucia and Marguerite. Anyway, I guess she had now won her spurs as New Zealand’s first prima donna. The next job was a jump-in, at Pavia, alongside the well-known tenor Oxilia. ‘The part of Lucia was assumed, without rehearsal, by the young diva, Adeline Zelda, who so often obtained ovations at the Royal Theater, Malta, in the same opera and in Faust. ‘To a pleasing and elegant appearance [she] joins a flexible and velvety voice and a most finished method of singing. She pronounces Italian perfectly and has extraordinary dramatic intuition’. ‘Signorina Zelda, in addition to an aristocratic figure, has a voice that is perfect in all the registers … her vocal agility is extraordinary and she has the true dramatic sensitiveness.’ Doubtless, mother again, but these were quotes. And then utter disaster struck. Theresa Josephine Corlett caught cold and died, 17 December 1895, in Milan. Mother was obviously the driving force of the family. Ethel brought her ashes back to California and …. and there, seemingly, ends the story of New Zealand’s first prima donna. Postscriptum: when I posted this wee article on Blogger, in 2016, stats told me that an amazing 570 people read it. But nobody came up with the answer. I don't know what prompted me to re-post it in winter 2018, but this time ... not all the answers, but some. Courtesy of champion researcher Colin Perry, on the other side of the world. Mr Corlett (sic) was named James. And he was indeed hopeless. "Bankruptcy Gazette. In the matter of James Corlett, of the City of Wellington, schoolmaster, a bankrupt. notice is hereby given that by order dated the 16th day of May, 1870, the above-named James Corlett was adjudicated a bankrupt, and Monday, the 23rd day of May, 1870, at 11 o'clock in the forenoon, in the Grand Jury Room, Supreme Court House, Lambton Quay, Wellington, appointed for the first meeting of his creditors and the choice of a trustee and supervisors of his estate. J. G. Allan, solicitor for the Bankrupt. 18th May, 1870." "in the Magistrate's Court this morning... James Corlett, charged with being drunk and disorderly, was fined 5s, or in default, committed for 24 hours." Colonist, 26 August 1873: 'The Wellington Post of August 21st states: "Early yesterday morning a man named James Corlett was found by the police helplessly intoxicated in Willis-street. He was conveyed to the lock-up, and by the evening, recovered his senses, and spoke sensibly to the man in charge. This morning, he seemed to be stupid, and had stripped off his clothes. These were put on him, and he was left until he could be brought before the Bench. A few minutes before 10, he was again found to have divested himself of clothing, and one of the police were sent into the cell to help him to dress. The appearance of Corlett at this time was such that the policeman deemed it necessary to call assistance. He left the cell for a couple of minutes for this purpose, and on his return with help, Corlett was found dead on the floor. There is little doubt that death resulted from an effusion of serum on the brain - the result of long-continued habits of intemperance." He was buried, so the Findagrave website tells, in a public plot at Bolton Street Cemetery, Karori ... just down the hill from my birthplace. James Corlett 1827-1873. So we know why he didn't go to San Francisco. And Theresa's description of 'widow' in the California directories was nothing but the truth. If she had ever been married, of course. Which needs to be proven! So, one more piece of the jigsaw in place. Plenty more to find!